Now how does this new twist on the old party game charades work? Well, you go into teams of three or more. Decide on a number of rounds or a point target to win. If you have 1 word guessed correctly that equals 1 point. Each team has one minute to guess as many words as possible. If the acting team doesn’t like a word, they can pass – but only one pass per round. Each team selects a guesser (everyone gets a turn guessing) and the rest of the team acts out the words. The other team holds the word cards for only the actors to see and flips the enclosed timer. Don’t talk!!! Not a peep from the team members acting. You lose a point if you speak or “mouth” any words to each other or the guesser. Use of objects (or even people) in the room is definitely permitted. Ready, set, go! Tally up points each round on a score pad. The first team to your target wins (unless, of course, your team is losing – then you can always suggest extending “one more round”)! Now dosent that sound like fun? Something different that is for sure! With words like: synchronized swimming, piñata, paparazzi, dogpile, leapfrog, pillow fight or CPR. This game is just plain fun! Since we have the juniors edition it is a little more basic and made for kids ages 6 and up. My daughter is just the right age for this game, she and her little friends will just love this! We love family game night and we especially love to play games when we have big get togethers. We were able to play the Reverse Charades Junior game at my daughter’s birthday party. What is better than a game at a party? This zany game was loads of fun. We set up the game in the middle of the parlor and set off to have fun! The girls were giggling the entire time, we split up into three groups with some adults and some kids. You should have seen the kids they were pretty good, and we all had a great time. The kids did try to mouth the answers a bit, and it took them a little while to understand the rules but they caught on. Much better than pin the tail on the donkey as a party game! Girls’ Night In Edition—perfect for that pink gift or girls-only parties with fun women-themed words like: mani-pedi, blind date, Charlie’s Angels, shaving legs, aerobics and soccer mom. A portion of the sales of this edition goes to support breast cancer research. Sports Edition—Get ready to rumble at tailgate parties and victory celebrations with athletic-themed words like: grand slam, fumble, Olympic torch, 7th inning stretch, synchronized swimming, kickboxing and tag team wrestling. Holiday Edition—The perfect stocking stuffer to make your parties and family gatherings even merrier and brighter with holiday-themed words like: Frosty the Snowman, mistletoe, snowball fight, sleigh ride, piñata and 10 Lords a-leaping. 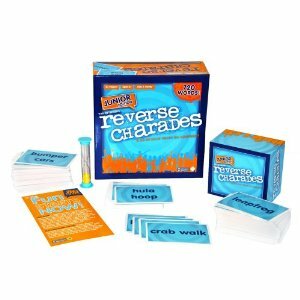 If you are looking for a special gift for that special person on your holiday gift list this year, make sure to pick up a copy of the Reverse Charades game, you will love it! The generous folks at Reverse Charades are giving own of Susan’s Disney Family readers a chance to win a Reverse Charades game of your choice. There are many Reverse Charades options, you can choose one of the following. Would you like to win? 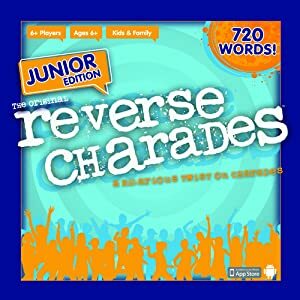 Please let me know what Reverse Charades game would you choose if you won? There are also other ways to enter, please enter below. i like the original reverse charades. The Holiday Edition Expansion Pack. I like the expansion pack for the Holiday Edition with the Reverse Charades.